Rooms on Sheerness sea front, opposite a beach. Some rooms have a sea view, others their own shower. The Isle of Sheppey, is popular with people who enjoy walking, cycling, sea and course fishing, fossil hunting, metal detecting, and bird watching. It also has an official nudist beach in Leysdown, and a blue flag award for water quality. Visit Sheerness Kent and the surrounding villages and stay in bandb, hotel or holiday apartment accommodation provided by BedPosts members. At the estuary of the River Medway by Isle of Sheppey sits Sheerness and its population of 12,000. Once a 16th century fort it now has a pier and a promenade and is a seaside resort. In the town centre is Kent's largest freestanding cast iron clock tower. 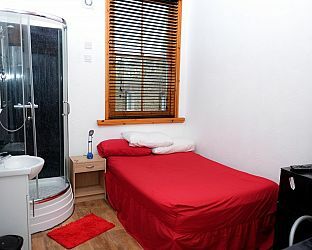 If you seek accommodation near Sheerness in Kent you have come to the website of a “club” of providers who offer affordable quality accommodation around UK in hotels, bed and breakfasts, guesthouses, inns, and restaurants plus self-catering cottages and apartments .